The 2018 Texas gubernatorial election took place on November 6, 2018, to elect the Governor of Texas, concurrently with the election of Texas's Class I U.S. Senate seat, as well as other congressional, state and local elections throughout the United States and Texas. Incumbent Republican Governor Greg Abbott successfully won re-election to a second term in office defeating Democrat Lupe Valdez, the former sheriff of Dallas County, and Libertarian Mark Tippetts, a former member of the Lago Vista city council. The Republican and Democratic party primaries were held on March 6, 2018, making them the first primaries of the 2018 electoral season. Abbott won the March 6 primary with 90% of the vote to receive the Republican nomination, while Democratic candidates Lupe Valdez and Andrew White advanced to a May 22 runoff. Valdez defeated White in the runoff with 53.1% of the vote and faced Abbott in the general election as the Democratic nominee. Valdez's nomination made her the first openly gay person nominated for governor by a major party in the state. Tippetts was nominated at the Libertarian Party of Texas' state convention in Houston April 13–15, 2018. He defeated four challengers on the first ballot and received more than 70% approval from Libertarian party delegates. Despite considerably closer contests in other Texas state elections, Abbott handily won a second term with the highest margin of victory of any state official on the ballot, although Valdez also won the largest vote share for a Democratic gubernatorial candidate since Ann Richards in 1994. 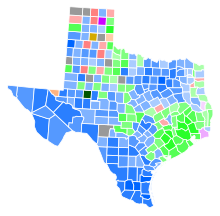 Tippetts' showing exceeded the previous record for most votes for a Libertarian nominee for Texas governor; that record had been set in 1990. Lupe Valdez and Andrew White proceeded to a run-off on May 22 since neither received 50% of the vote in the first round of the primary. Lupe Valdez won the runoff narrowly. Angela Paxton, wife of Texas Attorney General Ken Paxton and Republican candidate for Texas Senate, District 8. Gary Johnson, former Governor of New Mexico and Libertarian nominee for President of the United States in the 2012 and 2016 elections. William Weld, former Governor of Massachusetts and Libertarian nominee for Vice-President of the United States in the 2016 election. ^ "Greg Abbott to announce re-election bid Friday in San Antonio". Statesman.com. July 12, 2017. Retrieved February 27, 2018. ^ "Texas 2018 General Election". The Green Papers. Retrieved December 10, 2017. ^ a b Svitek, Patrick. "Valdez, White headed to runoff in Democratic gubernatorial primary." Texas Tribune. Mar. 6, 2018. ^ Svitek, Patrick; Formby, Brandon (May 22, 2018). "Lupe Valdez becomes first openly gay and first Latina candidate to win a major party nomination for Texas governor". The Texas Tribune. Retrieved May 22, 2018. ^ Ruiz-Grossman, Sarah (May 22, 2018). "Lupe Valdez Makes History In Texas By Winning Democratic Nod For Governor". Huffington Post. Retrieved May 22, 2018. ^ "Gov. Greg Abbott Clinches Second Term as GOP Wins Closest Statewide Races in 20 Years". The Texas Tribune. Retrieved November 16, 2018. ^ Jeffers Jr., Gromer (March 28, 2017). "Gov. Greg Abbott Remains Coy About 'Bathroom Bill,' Says He'll Run for Re-Election". The Dallas Morning News. Retrieved March 28, 2017. ^ Warren, Thomas (July 5, 2017). "Secession Advocate Kilgore Running Against Governor Abbott". The Amarillo Pioneer. Retrieved October 6, 2017. ^ Reigstad, Leif (September 25, 2017). "Here's a List of Everyone Running for Texas Governor So Far". Texas Monthly. Retrieved October 6, 2017. ^ a b Dallas Morning News Editorial (February 16, 2018). "We recommend Greg Abbott in the Republican primary for Texas Governor". Retrieved February 19, 2018. ^ Stutz, Terrence (June 1, 2015). "Lt. Gov. Patrick says he has no interest in running for governor in 2018 – or ever". The Dallas Morning News. Retrieved July 13, 2016. ^ Ratcliffe, R.G. (October 25, 2017). "Joe Straus Will Retire, But He's Not Ruling Out a Run for Governor". Texas Monthly. Retrieved October 26, 2017. ^ Tilove, Jonathan (October 26, 2017). "Joe Straus for governor? `I don't think so.'". Austin American-Statesman. Retrieved October 26, 2017. ^ a b @realDonaldTrump (February 27, 2018). "I want to encourage all of my many Texas friends to vote in the primary for Governor Greg Abbott, Senator Ted Cruz, Lt. Gov. Dan Patrick, and Attorney General Ken Paxton. They are helping me to Make America Great Again! Vote early or on March 6th" (Tweet) – via Twitter. ^ a b c d e f The Texas Tribune (October 27, 2017). "Vice President Mike Pence to headline fundraiser for Texas Gov. Greg Abbott". Retrieved February 24, 2018. ^ a b The Texas Tribune (January 9, 2017). "Dan Patrick Announces He's Running for Re-election". Retrieved February 24, 2018. ^ a b Empower Texans. "2018 Primary Endoresements". Retrieved February 19, 2018. ^ a b The National Rifle Association. "Texas Endorsements". Retrieved February 19, 2018. ^ "secedekilgore.com". Secedekilgore.com. Archived from the original on March 8, 2018. Retrieved May 22, 2018. ^ a b Ward, Mike (January 8, 2018). "Crowded Texas Democratic field for governor gathers for first forum". San Antonio Express-News. Retrieved February 19, 2018. ^ Fine, Julie (October 9, 2017). "Another North Texan Announces Plans to Run for Governor". NBC5 Dallas-Fort Worth. Retrieved October 11, 2017. ^ Warren, Thomas (December 1, 2017). "Mumbach to Run for Governor". The Amarillo Pioneer. Retrieved December 6, 2017. ^ a b "Election News for November 12". Texas Election Source. November 12, 2017. Retrieved November 13, 2017. ^ a b c "Texas Secretary of State: 2018 March Primary Election Candidate Filings by County". ^ Fink, Jack (July 14, 2017). "Gov. Abbott Begins Re-Election Bid As Democratic Candidate Emerges". KTXA. Retrieved July 17, 2017. ^ Nash, Tammye (July 14, 2017). "Jeffrey Payne announces run for Texas governor". Dallas Voice. Retrieved July 17, 2017. ^ "Former 'International Mr. Leather' Challenging Greg Abbott in Texas Governor's Race". July 18, 2017. ^ Ward, Mike (January 17, 2018). "Demetria Smith still campaigning as a Democratic candidate for governor". San Antonio Express-News. Retrieved February 19, 2018. ^ Svitek, Patrick (December 6, 2017). "Dallas County Sheriff Lupe Valdez, a Democrat, is running for governor". The Texas Tribune. Retrieved December 6, 2017. ^ Tilove, Jonathan (October 16, 2017). "`Berniecrat with a Panama hat,' Tom Wakely launches campaign against `neofascist' Greg Abbott". Austin American-Statesman. Retrieved October 18, 2017. ^ Svitek, Patrick (December 7, 2017). "Democrat Andrew White, son of late Gov. Mark White, announces gubernatorial bid". The Texas Tribune. Retrieved December 7, 2017. ^ "Yarbrough Joins Race for Governor". The Amarillo Pioneer. Retrieved December 6, 2017. ^ Tilove, Jonathan (October 30, 2017). "Austin's Garry Brown announces for governor: `Help me make sure that Hell freezes over.'". Austin American-Statesman. Retrieved October 30, 2017. ^ Svitek, Patrick (December 6, 2017). "Garry Brown, Travis County Democratic activist who had announced for governor in October, emails supporters that he's withdrawing and getting behind @LupeValdez. (Brown had never filed.)". Twitter. Retrieved December 7, 2017. ^ "Former Wichita Falls Resident Announces Candidacy for Texas Governor". News Talk 1290. November 20, 2017. Retrieved November 21, 2017. ^ Choate, Trish (December 11, 2017). "Former Wichitan dropping out of governor's race". Times Record News. Gannett. Retrieved December 18, 2017. ^ Wilson, Reid (July 19, 2017). "Dems desperate for candidates to turn Texas blue". The Hill. Retrieved July 20, 2017. ^ Svitek, Patrick (November 21, 2017). "Houston Councilman Dwight Boykins exploring run for Texas governor". The Texas Tribune. Retrieved November 21, 2017. ^ Ellis, Lindsay (December 10, 2017). "Boykins to stay on City Council, skip bid for governor". The Texas Tribune. Retrieved December 11, 2017. ^ Dovere, Edward-Isaac (August 24, 2017). "Castro twins' political ambitions collide". Politico. Retrieved August 24, 2017. ^ Tilove, Jonathan (September 19, 2017). "With no Democratic governor candidate, questions trail Joaquín Castro". Austin American-Statesman. Retrieved August 24, 2017. ^ Knapp, Deborah (October 19, 2015). "Julian Castro returns to San Antonio, says he's not running in 2018". KENS5. Retrieved January 24, 2017. ^ Livingston, Abby; Svitek, Patrick (February 9, 2017). "Texas Democrats begin to plot out strategy for 2018 midterms". The Texas Tribune. Retrieved February 10, 2017. ^ Svitek, Patrick (March 2, 2017). "Democrat Collier to challenge Patrick for lieutenant governor". The Texas Tribune. ^ Tinsley, Anna M. (March 8, 2017). "Wendy Davis won't rule out future campaign, but says 2018 run 'very doubtful'". Fort Worth Star-Telegram. Retrieved March 14, 2017. ^ Weissert, Will (August 8, 2017). "Texas Democrats Don't Have a Governor Candidate". U.S. News & World Report. Retrieved August 24, 2017. ^ Kuffner, Charles (September 4, 2017). "No re-rematch for Gallego against Hurd". Off the Kuff. Retrieved October 2, 2017. ^ Tilove, Jonathan (September 5, 2017). "Pete Gallego not running for old seat, but open to other 2018 races". Austin American-Statesman. Retrieved October 2, 2017. ^ a b Ward, Mike (October 2, 2017). "Democrats still looking for a reversal of fortunes in Texas". Houston Chronicle. Retrieved October 2, 2017. ^ a b c Jeffers Jr., Gromer (October 25, 2017). "Democrats want Paul Quinn College President Michael Sorrell to run for governor". The Dallas Morning News. Retrieved October 25, 2017. ^ a b Root, Jay (July 14, 2017). "With no opposition in sight, Texas Gov. Greg Abbott formally launches 2018 re-election bid". The Texas Tribune. Retrieved July 17, 2017. ^ Garcia, Gilbert (October 19, 2017). "Martinez Fischer likely to challenge Arévalo for his old seat". San Antonio Express-News. Retrieved October 25, 2017. ^ Herman, Ken (August 26, 2017). "Y'all, let's help the Democrats find a candidate for governor". Austin American-Statesman. Retrieved August 28, 2017. ^ Ellis, Lindsay (October 30, 2017). "McRaven: 'No interest' in running for Texas governor". Houston Chronicle. Retrieved October 30, 2017. ^ Fikac, Peggy (September 24, 2017). "Demo leader says it'd be OK to let Abbott go unchallenged". San Antonio Express-News. Retrieved October 2, 2017. ^ Jeffers Jr., Gromer (December 3, 2017). "Savior or bust: Can Dallas County Sheriff Lupe Valdez be a credible candidate for governor?". The Dallas Morning News. Retrieved December 11, 2017. ^ Eagle Editorial Board (February 20, 2018). "Eagle picks in contested Democratic state primary races". Retrieved February 20, 2018. ^ a b @LupeValdez (May 10, 2018). ".Honored to have your support, @JulianCastro! This year we have an opportunity to find a path for all Texans to succeed, invest in our public schools, and push back against hate! #VamosValdez" (Tweet) – via Twitter. ^ a b @Castro4Congress (February 24, 2018). ". @LupeValdez has spent her entire life fighting for Texans. That's what we need and deserve from our next Texas Governor" (Tweet) – via Twitter. ^ a b @GiffordsCourage (May 8, 2018). ".As the former Dallas County Sheriff, @LupeValdez knows the danger of letting guns fall into the wrong hands. She will be a Governor who protects 2nd amendment rights while fighting for gun safety laws, and we are proud to endorse her. giffords.org/2018/05/valdez/ #VoteCourage" (Tweet) – via Twitter. ^ a b @LupeValdez (March 20, 2018). "Thank you @SenatorSylvia for your support! Grateful for the endorsement, amiga. #txlege" (Tweet) – via Twitter. ^ a b @Menendez4Texas (February 26, 2018). "Please take a minute to watch my friend's and Gubernatorial candidate, Lupe Valdez's, video narrated by @JohnLeguizamo" (Tweet) – via Twitter. ^ a b c d e f g h i j k l "My Endorsements". Lupe Valdez for Governor. Retrieved May 10, 2018. ^ a b Mary Tuma (March 2, 2018). "Election Notes More news from the campaign trail". Retrieved March 1, 2018. ^ a b c d e f g h i j k l m n o p q r s t u v w x y z aa ab @LupeValdez (March 28, 2018). "I am thrilled to have earned the support from such a diverse and inspiring group of leaders from across our incredible state. Our movement is bringing together Texans of all backgrounds to fight for a new vision for Texas. #txlege" (Tweet) – via Twitter. ^ a b c d e f g h i j k l @PatrickSvitek (April 25, 2018). ". @LupeValdez rolls out Harris County endorsements ahead of Houston forum this evening with @randrewwhite. #txgov" (Tweet) – via Twitter. ^ a b "Lupe Valdez Grassroots Fundraiser hosted by Anchia and Friends". January 11, 2018. Retrieved January 14, 2018. ^ a b "Cooking pan de campo with my friend and supporter, State Rep. Terry Canales, in Edinburg tonight. It's great to be back in the Rio Grande Valley for a few days". February 12, 2018. Retrieved February 12, 2018. ^ a b Stephen Young (January 16, 2018). "Initial Fundraising Numbers Show Lupe Valdez Campaign Way Behind". Retrieved January 20, 2018. ^ a b @GinaForAustin (February 27, 2018). "If you have a moment, this short video about Sheriff Lupe Valdez who is running for Governor is worth the watch. I am proud to be supporting a candidate who represents the best of who we are" (Tweet) – via Twitter. ^ a b c d e f @PatrickSvitek (March 2, 2018). "With four days until primary, @LupeValdez rolls out endorsements from all Democrats on the Dallas County Commissioners Court:" (Tweet) – via Twitter. ^ a b "Enjoyed meeting with elected officials and community leaders in Willacy County. Thanks to Raymondville Mayor Gilbert Gonzales for being a wonderful host today!". February 20, 2018. Retrieved March 1, 2018. ^ a b Peggy Fikac (February 11, 2018). "Dallas County judge backing Lupe Valdez for governor". Retrieved February 12, 2018. ^ a b "With my good friend Sheriff Omar Lucio on a beautiful South Texas Sunday afternoon. Glad to have his support in Cameron County as we bring back common sense to Texas". January 14, 2018. Retrieved January 14, 2018. ^ a b "Wonderful turnout at our meet-and-greet in El Paso last night. Thanks to Sheriff Richard Wiles for hosting us!". February 19, 2018. Retrieved March 1, 2018. ^ a b @JohnLeguizamo (March 11, 2018). "Flip it blue #Texas! I know you can! @LupeValdez @MALDEF @LULAC @HispChamberCCC @HispanicArts @HispanicCaucus @LatinosMatter @Latina @NBCLatino @latinovictoryus @RockTheVote" (Tweet) – via Twitter. ^ a b @DianeRavitch (March 8, 2018). "I support Lupe Valdez. Since I can't vote for (I live in NY, but born in Texas), I sent money. Time to change Texas!" (Tweet) – via Twitter. ^ a b W. Gardner Selby (May 15, 2018). "Did Cecile Richards say there's room in 'her movement' for people who think abortion is wrong?". PolitiFact. Retrieved May 16, 2018. ^ a b Mike Ward (January 22, 2018). "AFL-CIO political arm endorses Lupe Valdez". Retrieved January 30, 2018. ^ a b @TexasEquityPAC (April 10, 2018). "The @TexasEquityPAC , the political action committee of @EqualityTexas endorses Democratic Gubernatorial Candidate @LupeValdez for the May 22, 2018 runoff elections. www.texasequitypac.org" (Tweet) – via Twitter. ^ a b c "Honored to receive the endorsement of the Texas Tejano Democrats. Our grassroots campaign is proud of the many Democratic endorsements we've received including Planned Parenthood Texas Votes, the Texas AFL-CIO, Stonewall chapters in Houston, Dallas, San Antonio, and Denton, and numerous other progressive organizations across our state". February 5, 2018. Retrieved February 5, 2018. ^ a b Jonathan Tilove (February 5, 2018). "Knocked for a Lupe". Retrieved February 5, 2018. ^ a b "For decades, millions of Texans, including women and their families, have come to rely on Planned Parenthood for critical healthcare services. Planned Parenthood has stood strong defending Texas women's rights. I'm honored to stand with them and have their endorsement". February 5, 2018. Retrieved February 5, 2018. ^ "Stonewall Endorsed Candidates for March 6 Primaries - Stonewall Democrats of Austin". Stonewallaustin.org. Retrieved May 22, 2018. ^ Sam Sanchez (January 29, 2018). "Stonewall Democrats Announce Endorsements for March Primary". Retrieved January 30, 2018. ^ Chronicle Editorial Board (February 16, 2018). "Chronicle Endorsements". Retrieved February 20, 2018. ^ Editorial Board (February 19, 2018). "Texas Primary Election 2018: Corpus Christi Caller-Times Endorsements". Retrieved February 20, 2018. ^ Patrick Svitek (December 7, 2017). "Democrat Andrew White, son of late Gov. Mark White, announces gubernatorial bid". Retrieved January 17, 2018. ^ a b @PatrickSvitek (March 11, 2018). "Missed this -- @randrewwhite endorsed by Cedric Davis, who finished 3rd out of 9 in #txgov primary Tuesday (8%), and Michael Cooper, runner-up in lite gov primary who got 48% against @CollierForTexas" (Tweet) – via Twitter. ^ "Endorsements". February 4, 2018. Retrieved February 4, 2018. ^ "2018 Democratic Primary Endorsements". Mailchi.mp. Retrieved February 27, 2018. ^ "Endorsements". February 14, 2018. Retrieved February 16, 2018. ^ @jolt_texas (April 29, 2018). "We're proud to announce that Jolt endorses @BetoORourke for U.S. Senate & @randrewwhite for Texas Governor" (Tweet) – via Twitter. ^ @randrewwhite (April 19, 2018). "Honored to receive the Gun-Sense Candidate distinction from @MomsDemand. I believe, as they do, that we can fully support the 2nd Amendment while supporting common-sense gun legislation that reduces death & injury from gun violence in our state & country. #GunReformNow #DoRightTX" (Tweet) – via Twitter. ^ @PatrickSvitek (April 16, 2018). "Inbox: North East Bexar County Democrats endorse @randrewwhite in #txgov runoff against @LupeValdez. White spoke to the group Saturday morning" (Tweet) – via Twitter. ^ Sean Collins Walsh (February 3, 2018). "For Governor:Andrew White is the Democratic Party's George W. Bush in 2018". Retrieved February 4, 2018. ^ Dallas Morning News Editorial (February 4, 2018). "We recommend Andrew White in the Democratic primary for Texas Governor". Retrieved February 4, 2018. ^ "Abbott and White in governor's races - San Antonio Express-News". M.mysanantonio.com. February 19, 2018. Retrieved February 27, 2018. ^ "Andrew White is the best gubernatorial candidate for students | The Daily Texan". Dailytexanonline.com. February 20, 2018. Retrieved February 27, 2018. ^ "Andrew White is the best Democrat to face Greg Abbott in the fall". Star-telegram.com. Retrieved May 12, 2018. ^ a b "2018 Candidates". Lptexas.org. Retrieved December 20, 2017. ^ Ward, Mike (November 6, 2017). "Kathie Glass announces Libertarian bid for governor - Houston Chronicle". Chron.com. Retrieved February 27, 2018. ^ "Kory Watkins For Texas Governor Campaign Releases Glass Pipes To Show He Is The Real Deal". The Daily Haze. October 27, 2017. Retrieved January 2, 2018. ^ Christi Craddick [@ChristiCraddick] (March 16, 2018). "Calling all Texas Republican women. #KeepTexasRed @TexasGOP @TFRW" (Tweet) – via Twitter. ^ Miller, Sid (May 27, 2018). "Sid Miller on Facebook". Facebook.com. Retrieved May 28, 2017. ^ a b @MattShaheen (September 3, 2018). "WHuge Collin County GOP Labor Day Rally! So many fired up about Keeping Texas Red to continue our growing prosperity and high quality of life!! #VoteGOP #HD66 @GregAbbott_TX @VanTaylorTX @KenPaxtonTX @AngelaPaxtonTX @candynoble @Scott_SanfordTX @leachfortexas @justinaholland" (Tweet) – via Twitter. ^ a b c d e f @AngelaPaxtonTX (March 20, 2018). "What a wonderful event today in Frisco hosted by Jerry Jones for @GregAbbott_TX. So good to see so many friends. Thank you Bobby and Phyllis Ray for inviting me as your guest. @leachfortexas @MattShaheen @candynoble @Scott_SanfordTX @SenBobHall @KonniBurton" (Tweet) – via Twitter. ^ a b c d e @MattRinaldiTX (May 5, 2018). "What enthusiasm gap? Great crowd at @DallasGOP block walk w/ @GregAbbott_TX @DonHuffines @LindaKoopHD102 @AngieChenButton @lisalubyryan. #txlege #KeepTexasRed" (Tweet) – via Twitter. ^ @VanTaylorTX (September 5, 2018). "America as #1. Republican policies are driving economic success. Proud to work w @GregAbbott_TX @leachfortexas @Scott_SanfordTX @CandyNobleHD89 forTexas and Collin County" (Tweet) – via Twitter. ^ Crossroads Today (May 5, 2018). "Gov. Greg Abbott to kick off statewide Block Walking Event". Retrieved May 5, 2018. ^ @glennbeck (May 27, 2018). "@GregAbbott_TX is the best governor I have ever had the honor to watch. Soro's is pouring millions into Texas to turn it blue. 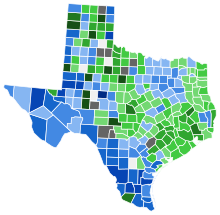 Only TWO counties are keeping Texas Red. It is that close. #wakeuptexans I pray for the Gov to remain strong, decent and in office" (Tweet) – via Twitter. ^ @AbbottCampaign (April 11, 2018). ". @GregAbbott_TX: ". @GregAbbott_TX: "I am proud to receive the endorsement of the Associated Plumbing-Heating-Cooling Contractors of Texas PAC. They understand the importance of fostering successful small businesses & economic achievements through low taxes & reasonable regulations."" (Tweet) – via Twitter. ^ @AbbottCampaign (April 6, 2018). ".@GregAbbott_TX: . @GregAbbott_TX: "I am proud to receive the endorsement of the Rural Friends of Electric Cooperatives PAC, an organization that works diligently to provide energy resources to rural Texans and businesses."" (Tweet) – via Twitter. ^ @AbbottCampaign (April 18, 2018). ". @GregAbbott_TX: "I look forward to working with the Texas Agricultural Aviation Association and others over the next four years as we bring even more innovation to Texas' thriving agricultural industry."" (Tweet) – via Twitter. ^ @AbbottCampaign (May 3, 2018). ". @GregAbbott_TX: ". @GregAbbott_TX: "I am honored to receive the endorsement of the Texas Hospital Association's political action committee, and I am excited to work with them to strengthen our hospitals and health systems and provide even greater care to the people of Texas.""" (Tweet) – via Twitter. ^ @AbbottCampaign (April 25, 2018). ". @GregAbbott_TX: ". @GregAbbott_TX: "I am honored to receive the endorsement of the Texas Pyrotechnic Association PAC, an organization that epitomizes the powerful force of small businesses in our great state."" (Tweet) – via Twitter. ^ Lauren McGaughy (July 27, 2018). "Largest police group in Texas endorses Greg Abbott over former Dallas County Sheriff Lupe Valdez". The Dallas Morning News. ^ "WATCH: NFIB Texas PAC Endorses Governor Abbott for Second Term". NFIB. July 12, 2018. ^ David Tarrant (September 20, 2018). "Dallas sheriff's association endorses Gov. Greg Abbott over their former boss, Lupe Valdez". DallasNews.com. ^ "We recommend Greg Abbott for governor". Dallas Morning News. October 18, 2018. ^ "Gov. Abbott for a second term". San Antonio Express-News. October 18, 2018. ^ "For Texas governor: Greg Abbott, without a doubt". Fort Worth Star-Telegram. October 26, 2018. Retrieved October 28, 2018. ^ @TomPerez (May 24, 2018). ".Representation matters and we are working hard to elect Democratic candidates in every ZIP code and up and down the ballot who look like the people they serve. ¡Adelante, @LupeValdez!" (Tweet) – via Twitter. ^ @sethmoulton (September 20, 2018). "I am proud to endorse a new group of @serve_america candidates who will put public service before personal gain. They are ready to bring a new generation of leadership to Washington and to state capitals across the country! I hope you will join me in supporting their campaigns" (Tweet) – via Twitter. ^ @WendyDavis (May 22, 2018). "Congratulations @LupeValdez!" (Tweet) – via Twitter. ^ @JohnsonforTexas (May 31, 2018). "Great to spend time with my fellow @dallasdemocrats, especially my wife @FemmeNakita and the next Governor of Texas, @LupeValdez! #JohnsonJordan18 #txlege" (Tweet) – via Twitter. ^ @ChrisGTurner (May 22, 2018). "Congratulations to @LupeValdez on winning the Democratic nomination for #TXgov. And thank you to @randrewwhite for the race you ran. Onward to November! #txlege" (Tweet) – via Twitter. ^ @CollierforTexas (May 22, 2018). "Congratulations to @LupeValdez for winning the Democratic nomination for Governor of Texas. I look forward to working with Sheriff Valdez to help make a better state for ALL Texans" (Tweet) – via Twitter. ^ "Lupe Valdez Speaks to Her Win as Democratic Nominee for Texas Governor". MSNBC. May 28, 2018. Retrieved May 28, 2018. ^ @GeorgeTakei (May 23, 2018). "Congratulations to @LupeValdez, who won her primary for governor of Texas and is pretty much Trump's worst nightmare: a lesbian, Latina former sheriff—in short, the progressive answer to bigot and pardoned felon Joe Arpaio. Give her a follow, friends. #BlueWave" (Tweet) – via Twitter. ^ @randrewwhite (May 22, 2018). "Congratulations to @LupeValdez for winning the Democratic nomination for Governor of Texas. She has my endorsement and my support. Let's #DoRightTX and win in November!" (Tweet) – via Twitter. ^ @AnniesListTX (May 23, 2018). "Annie's List is pleased to announce our endorsement of @LupeValdez for Governor, @joifortexas for Comptroller and @KimOlson4TxAg for Commissioner of Agriculture. We are excited for their campaigns and believe these women truly represent the future of Texas!" (Tweet) – via Twitter. ^ @HRC (September 7, 2018). ". @HRC is proud to endorse @LupeValdez for governor of Texas. She is the first out #LGBTQ Latina candidate in the nation to win a major party's nomination for governor. #VamosValdez #TXGov #TXLege www.hrc.org/blog/hrc-endorses-lupe-valdez-in-her-historic-bid-for-governor-of-texas …" (Tweet) – via Twitter. ^ @Mark4Gov (May 24, 2018). "It was great to receive an endorsement from @GovGaryJohnson recently. He has also agreed to serve as a policy adviser on my campaign - thank you Gary! Check out the rest of my team at mark4gov.com/?page_id=12" (Tweet) – via Twitter. ^ @GovBillWeld (August 25, 2018). "Mark Tippetts is a business leader, father of four, and understands the issues facing Texans today. He knows what it takes to create jobs, keep government out of the way, and defend our freedoms. He will make a great Governor. I proudly endorse @Mark4Gov for Governor of Texas" (Tweet) – via Twitter. ^ "East County Liberty Talk". Facebook.com. Retrieved April 3, 2019. ^ "Endorsement News for October 11 - Texas Election Source". Txelects.com. Retrieved April 3, 2019. ^ a b "My Team". Mark Tippets Campaign. Retrieved June 18, 2018. ^ @Mark4Gov (July 13, 2018). "IWith @nsarwark, the chair of the Libertarian National Party. #LetMarkDebate #EndTwoPartyRule" (Tweet) – via Twitter. ^ "2018 Governor Race ratings | The Cook Political Report". The Cook Political Report. Retrieved November 15, 2017. ^ "Gubernatorial Ratings | Inside Elections". Insideelections.com. Retrieved November 15, 2017. ^ "Larry J. Sabato's Crystal Ball » 2018 Governor". Centerforpolitics.org. Retrieved November 15, 2017. ^ "2018 Governor Races". RealClearPolitics. October 9, 2018. ^ "2018 Governor Elections: As November Nears, More Governors' Races Become Tossups". Governing.com. Retrieved July 18, 2018. ^ "2018 General Election". Texas Secretary of State. Retrieved December 5, 2018.